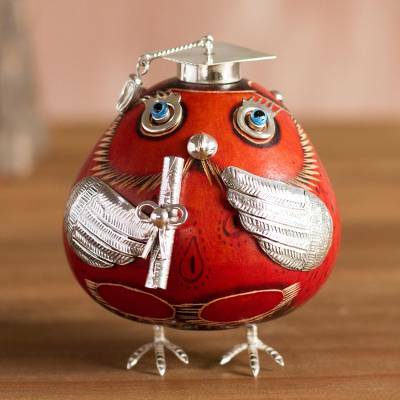 Sterling Silver and Gourd Owl Figurine in Red from Peru, "Pride of Graduation"
Full of pride, a delightful owl accepts its diploma of graduation. Peruvian artisan Maria Astuhuaman creates this beautiful figurine, crafted from a gourd and painted red. The bird's hat, diploma, and other accents are all crafted from sterling silver.